Up on the observation deck formal bird and mammal observations are taking place for the extent of the trip. 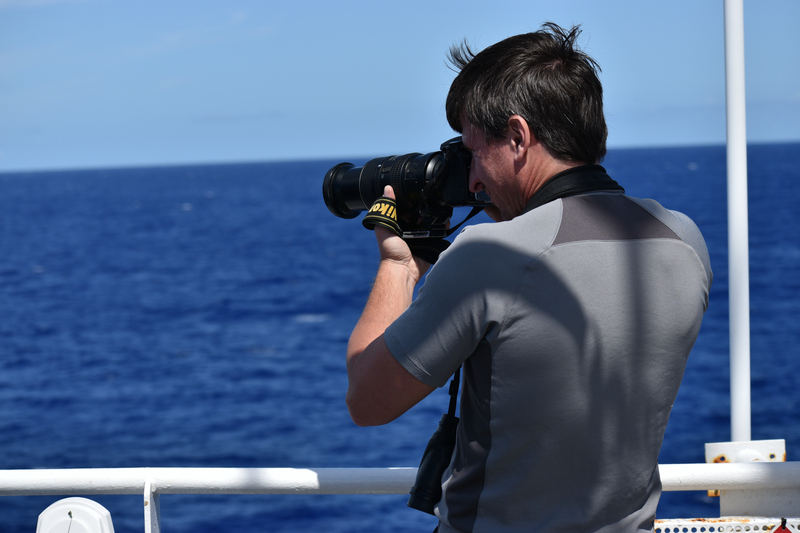 When recording sighting of birds, observers observe an approximate 300m square area in the front of the ship. Any seabird that flies or swims through that zone is counted and recorded. Doing these observations over time can give approximations on bird population trends. 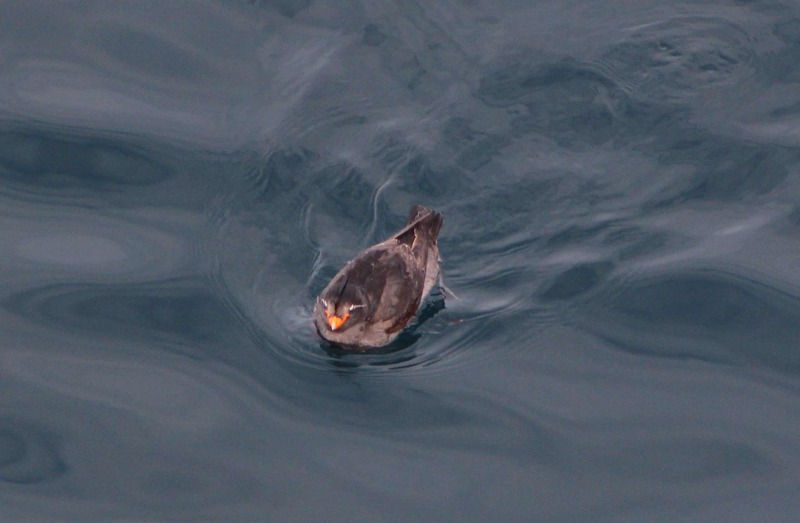 Here is a picture I took of a Crested Auklet who floated close by to the ship. Crested Auklets eat primarily plankton and breed in the number of millions in nearby islands of the Bering Sea. The same can be done for whales. In this case the visible range is used. 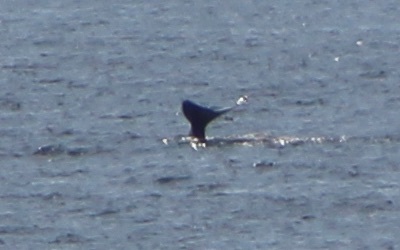 With the low angle sunlight, it is easy to see the whale spout from a whale on the horizon, however closer range views of whales is needed for identification. That’s most effectively done on the long range by taking pictures of the whale’s tail. Here is a picture I took today of a gray whale’s tail. Gray whales frequent the area for its shallow sea and dive to the bottom to eat bottom dwelling sea life such as crustaceans by scooping up the bottom of the sea and filtering out the seabed leaving the food. But how do you observe whales when you are not in the Arctic? You eavesdrop on them….. Observing whales acoustically for the next year. Today I was observing with help of binoculars and a camera to see whales that were in view of the ship. But how do you know if a whale visited when you where gone? Record their voices. Primary investigator Katherine Berchok assisted by Stephanie Grassia are retrieving and replacing acoustic (sound) monitoring devices suspended above the sea floor. Today one of these instruments that was placed on the sea floor a year ago is now being retrieved. Within the retrieved equipment is a recording of acoustics that have occurred in the last year. The sound waves were recorded in a pattern of 80 minutes every 5 hours for an entire year. That is a lot to listen to, so recordings will go through processing through different software to see if any sound wave patterns are close to those created by different whale species. 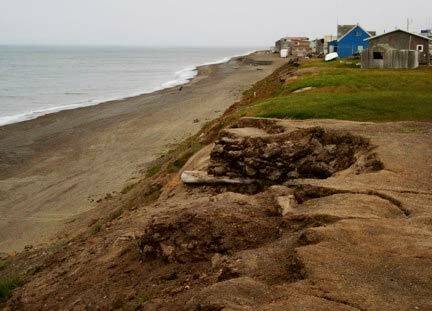 Though this data cannot give an accurate count of how many whales are in an area at a particular time, it does allow scientist to verify what species of whales and also walruses visit the study area. This picture here shows the new underwater microphone or hydrophone (the white tube) being prepared to be lowered into the sea to be retrieved next year. Once lowered in the area pictured here it will be covered in about 30 meters of ocean. So how will it be found next year? 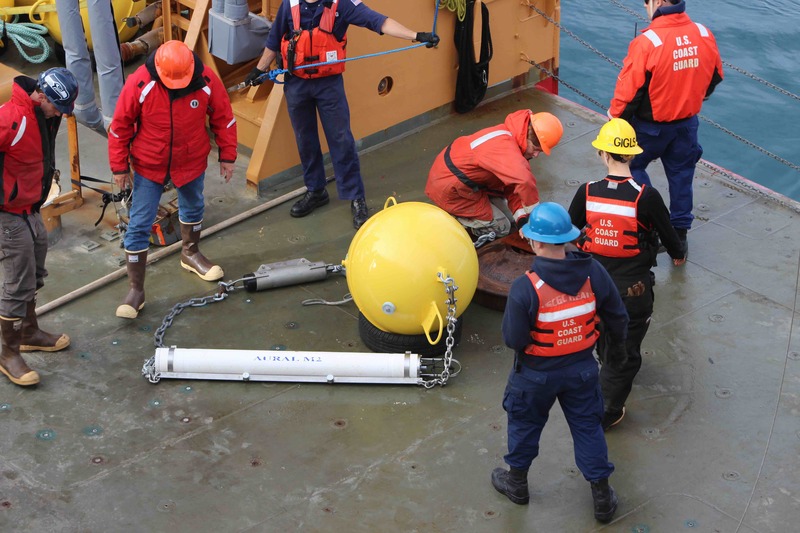 There is transmitter (the small gray tube) that will allow scientist to find it, send a signal and have the instruments released from the weight and float to the surface. This year’s instrument will be cleaned up and reused next year. 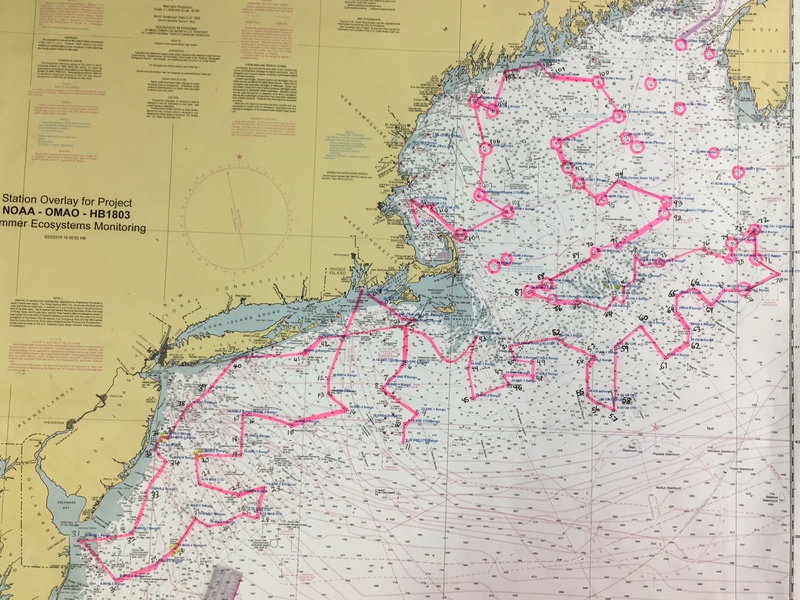 Geographic Area of Cruise: Northeastern Coast of U.S.
As the Henry B. Bigelow traverses the Gulf of Maine sampling the microorganisms at stations, another pair of scientists are observing bird and marine mammal populations. 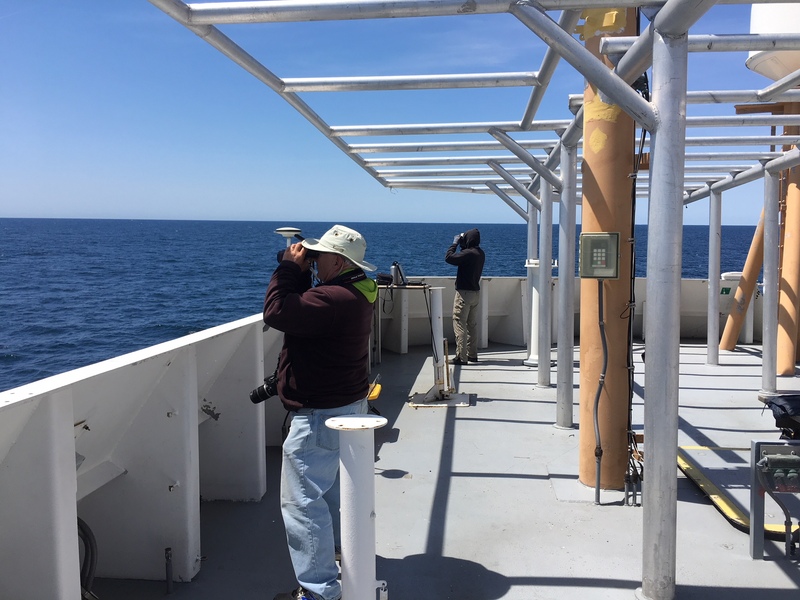 Much of my time between sampling stations, I head up to the flying bridge and join Nicholas Metheny and John Loch, Seabird Observers, on the lookout for the seabird and marine mammals. The seabirds most commonly observed in the Gulf of Maine are the Wilson Storm Petrel and the Sooty Shearwater. These two species account for 60% of the birds seen. 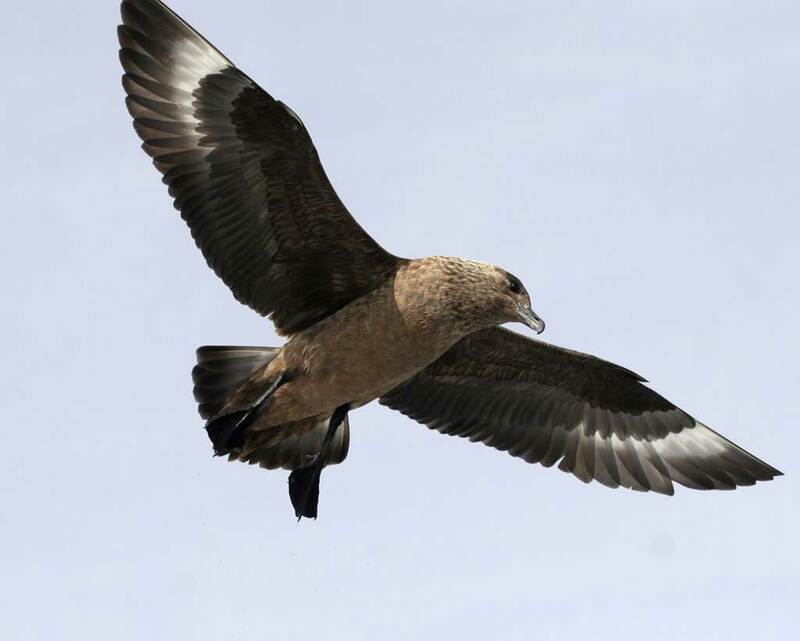 These pelagic seabirds live offshore and only return to land to breed, often on remote islands. All the samplings taken with bongo nets are samplings of the producers and primary consumers, the small organisms in the food chain. On the observation deck, the fish and marine mammals that rely on a healthy bottom food chain are observed. Spotting marine mammals adds much to the excitement of the day. 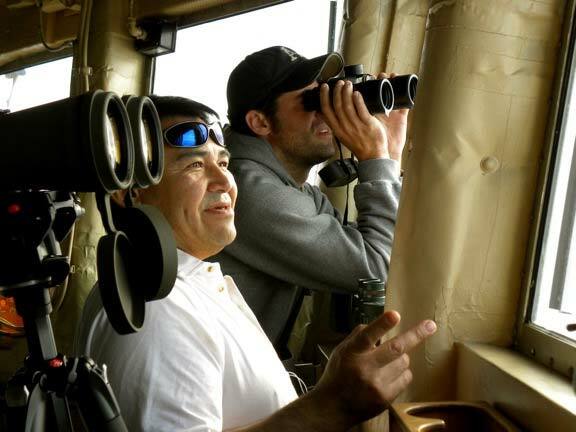 The bridge will announce a sighting and if possible, one gets to the flying bridge to see the wildlife. One of the first sightings was of humpback whales in the distance, followed by sperm whale and pilot whale sightings. 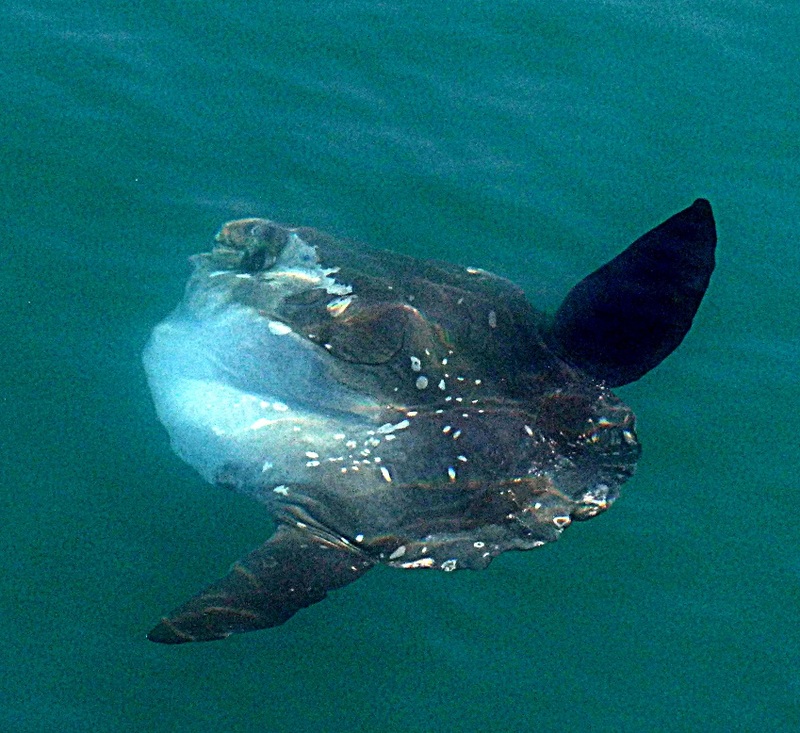 The most fascinating sightings were of Mola Mola- Ocean Sunfish. 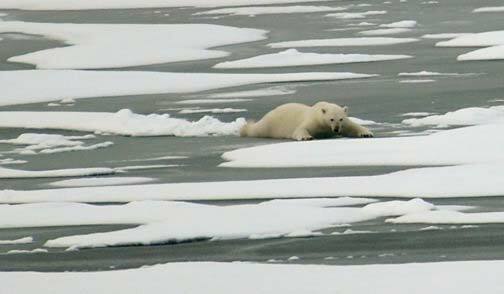 They were spotted often and very close to the ship. The science crew is kept busy sampling at each station. There is some down time steaming from station to station at 12 knots but it is enjoyable. I spend the down time talking to crew and scientists. Chief Scientist Jerry Prezioso has been an awesome mentor and photographer! I am learning so much and am so excited to bring it back into my classroom next year. 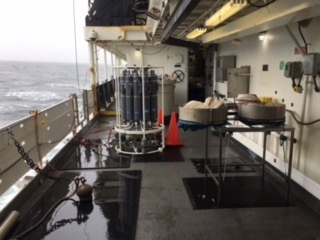 The seas have been relatively calm but the forecast for the end of the cruise is not favorable for sampling due to high winds. 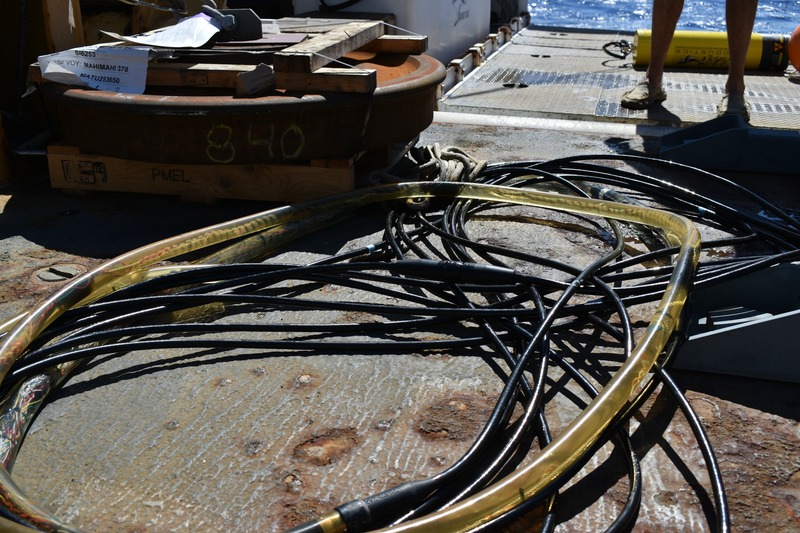 If winds are over 30 knots, the crew has difficulty deploying the nets so sampling is suspended. The science crew has taken samples from 114 stations. These samples will be sent off to be analyzed at different labs. The cruise was cut short by two days due to high winds. 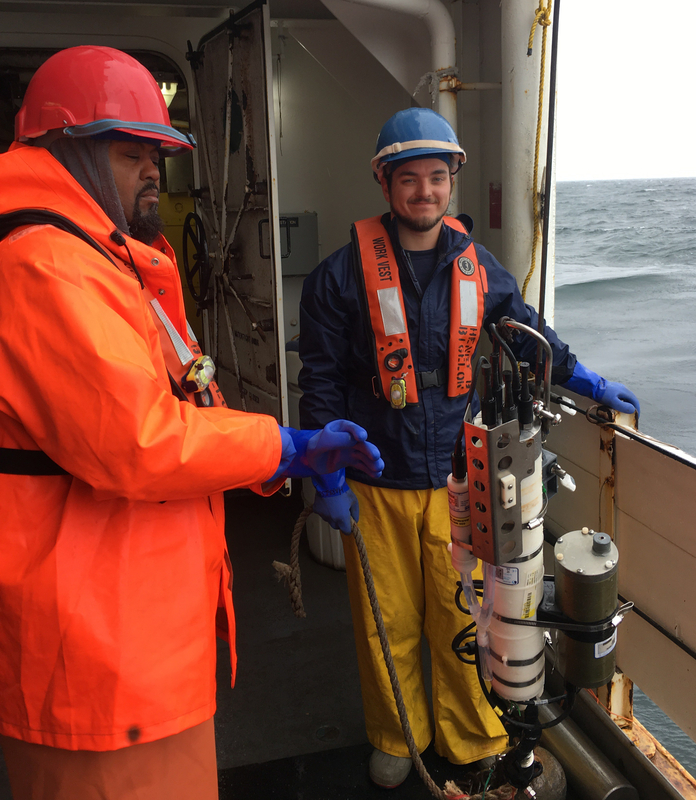 The last sampling station was in Cape Cod Bay. Tomorrow the ship will head back to port through the Cape Cod Canal, ending a fantastic cruise. I am so excited to see the data from all these samples. Thanks Teacher at Sea program for a great adventure! 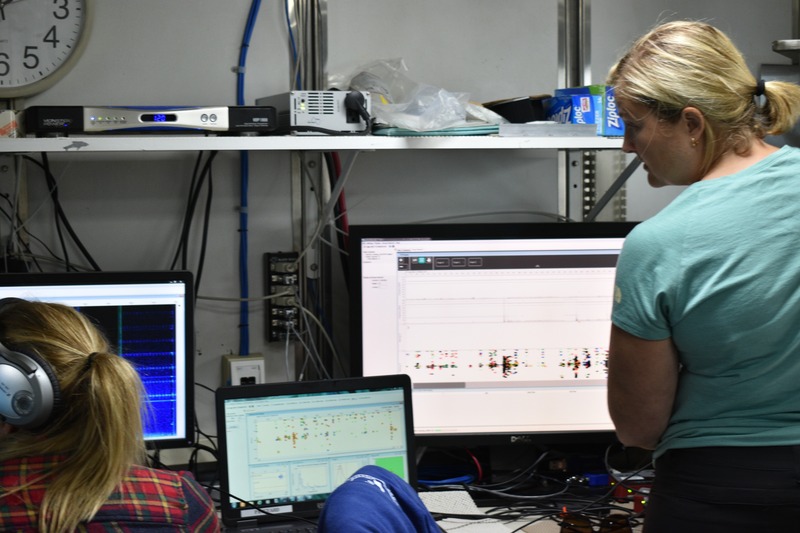 While the visual team is working hard on the flying bridge, scanning the waters for our elusive cetacean friends, acoustics is down in the lab listening for any clues that there might be “something” out there. At any given time, two acousticians are listening to the sounds of the ocean via a hydrophone array. This array is a long microphone pulled behind the ship as she cuts through the water. When the acousticians hear a click or a whistle, a special computer program localizes (or determines the distance to) the whistle or the click. But it’s not quite as simple as that. There’s a lot of noise in the ocean. The array will pick up other ship noise, cavitation (or bubbles from the propeller) on our ship, or anything it “thinks” might be a cetacean. The acoustics team must determine which sounds are noise and which sounds belong to a mammal. 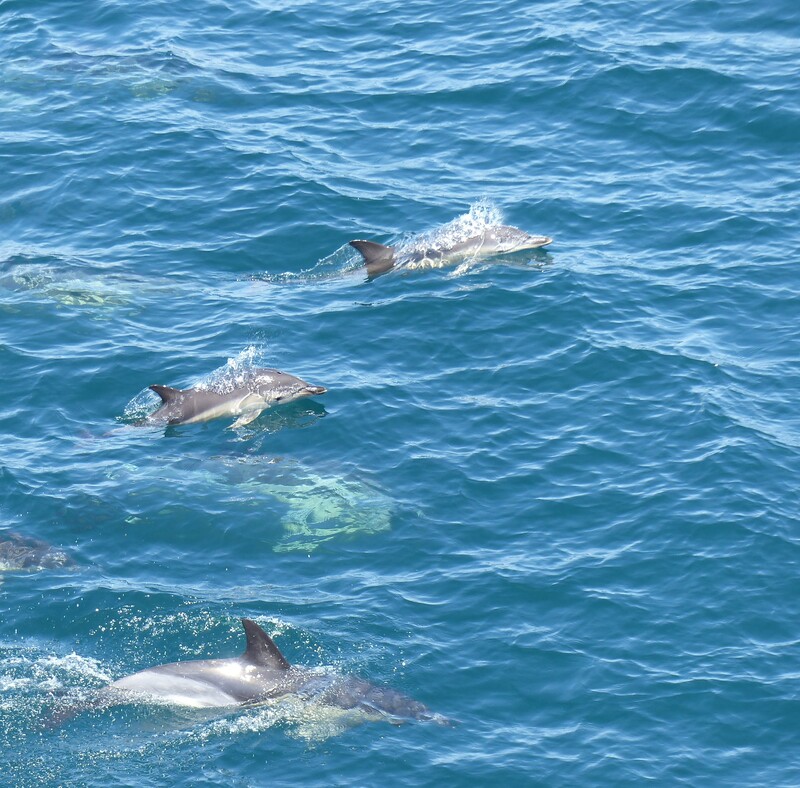 What the acousticians are looking for is something called a “click train.” These are sound produced by dolphins when they are foraging or socializing and are a good indicator of a nearby cetacean. On the computer screen, any ambient noise shows up as a plotted point on an on-screen graph. When the plotted points show up in a fixed or predictable pattern, then it could be a nearby cetacean. The acousticians are also listening to the sounds on headphones. When they hear a whistle or a click, they can find the sound they’ve heard on the plotted graph. On the graphical representation of the sounds coming in to the hydrophone, the x-axis of the graph is time, and the y-axis is a “bearing” angle. It will tell which angle off the ship from the front the noise is coming from. For example, if the animal is right in front of the bow of the ship, the reading would be 0 degrees. If it were directly behind the ship, then the plotted point would come in at 180 degrees. With these two pieces of information, acousticians can narrow the location of the animal in question down to two spots on either side of the ship. When they think they have a significant sound, the acousticians will use the information from the graph to localize the sound and plot it on a map. Often times they can identify the sound directly to the species, which is an extraordinary skill. Here’s where things go a little “Fight Club.” (First rule of fight club? Don’t talk about fight club.) Once the acousticians localize an animal, they must determine if it is ahead of the ship or behind it. Let’s say for example an acoustician hears a Pilot Whale. He or she will draw a line on a computerized map to determine the distance the whale is to the ship using the data from the graph. This is a “clean” localization of a marine mammal. Notice the two spots where the lines cross – those are the two possible locations of the mammal we are tracking. The ship is the red dot, the blue dots are the hydrophone as it is towed behind the ship. 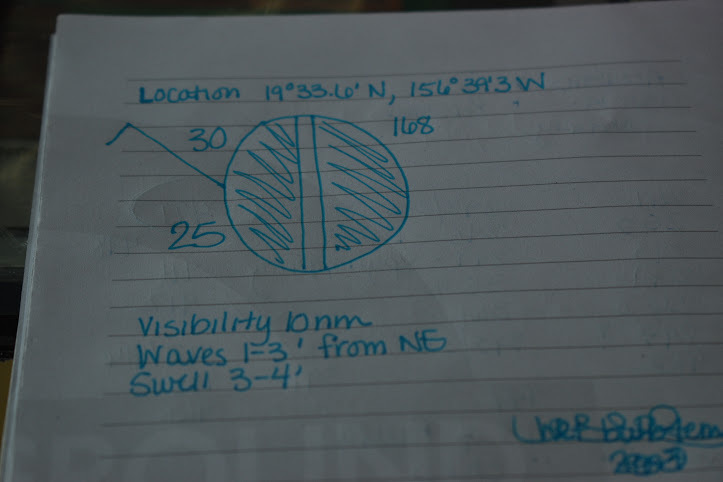 Because the hydrophones are in a line, the location provided from the array shows on the left and the right sides. So, the map plots both of those potential spots. The two straight lines from the ship to the animal make a “V” shape. As the ship passes the animal, the angle of the V opens up until it becomes a straight line, much like opening a book to lay it flat on the table and viewing how the pages change from the side. 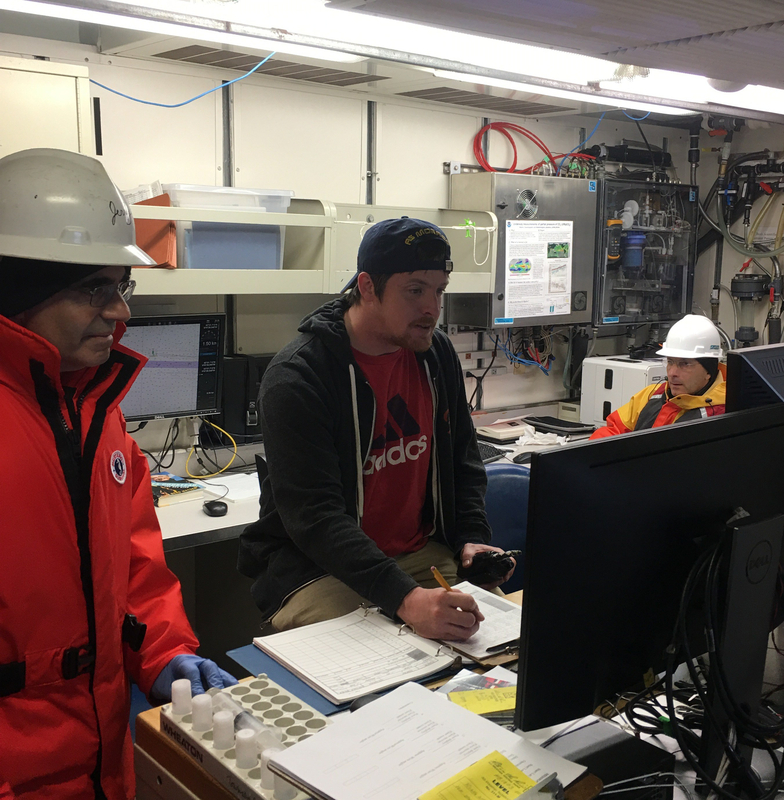 As long as the animal or animal group is ahead of the ship, the acousticians will alert no one except the lead scientist, and especially not the marine observers. If a crew member or another scientist who is not observing mammals just so happens to be in the acoustics lab when the localization happens, we are sworn to secrecy, as well. Sometimes an acoustician will send a runner to get the lead scientist to discreetly tell her that there is something out there. The screenshot on the left shows a series of spotted dolphin “click trains.” Notice the marks all in a line along the graph. The right photo shows the various localizations that the acoustics team has picked up from the click train graph. The red dot is the ship, the gray line is the “track line”, and the two blue dots behind the ship are the hydrophone arrays. Notice the V shape gradually goes to a straight line and then turns in the opposite direction. As the mammals “pass the beam” (the signal is perfectly on either side of the ship, and starting to make an upside down V from the ship), the acousticians can alert the visual team of the sighting. As soon as everyone is aware the mammals are out there, either by sight or sound, the whole scientific group goes “off effort,” meaning we funnel our energy in to counting and sighting the mammals we have found. When this happens, communication is “open” between the acoustics team and the visual team. The visual team can direct the bridge to head in any direction, and as long as it’s safe to do so, the bridge will aid in the pursuit of the mammals to put us in the best position to get close enough to hopefully identify the species. Today, one mammal observer had a sighting almost 6 miles away from the ship, and she could identify the species from that distance, as well! Even cooler is that it was a beaked whale, which is an elusive whale that isn’t often sighted. They have the capability of diving to 1000m to forage for food! When the visual team has a sighting, the three visual observers who are on shift have the responsibility to estimate the group size. Chris captures photos of Melon Headed Whales for Photo ID. Here we go with Fight Club again – no one can talk to one another about the group sizes. Each mammal observer keeps their totals to themselves. This is so that no one can sway any other person’s opinion on group size and adds an extra element of control to the study. It is off limits to talk about group sizes among one another even after the sighting is over. We must always be vigilant of not reviewing counts with one another, even after the day is done. The scientific team really holds solid to this protocol. Once the sighting is over, all parties resume “on effort” sightings, and the whole process starts all over again. Now, you might be thinking, “Why don’t they just wait until acoustics has an animal localized before sending the mammal team up to look for it? 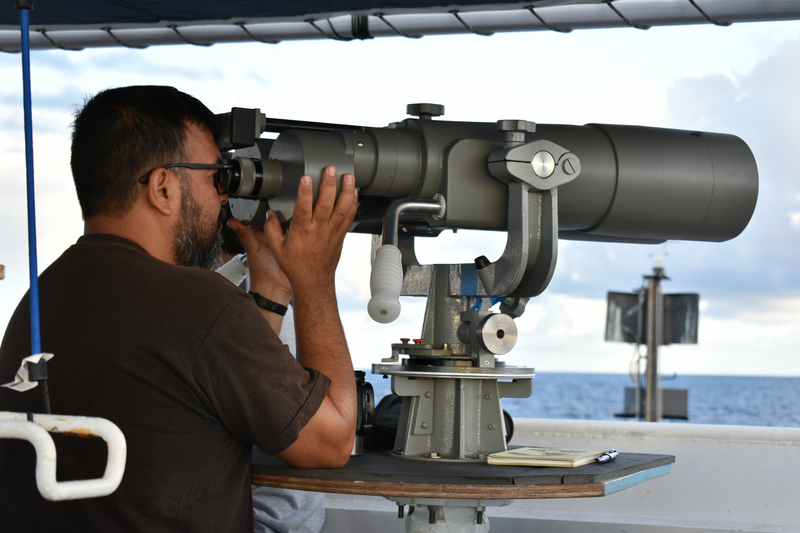 Surely if acoustics isn’t hearing anything, then there must not be anything out there.” As I am writing this post, the visual team is closing in on a spotted dolphin sighting about 6.5 miles away. The acoustics did not pick up any vocalizations from this group. Shannon and Jen in the acoustics lab “seeing” the sounds of the ocean. This also happened this morning with the beaked whale. Both teams really do need one another in this process of documenting cetaceans. Further, the acoustics team in some cases can’t determine group sizes from the vocals alone. They need the visual team to do that. Each group relies on and complements one another with their own talents and abilities to conduct a completely comprehensive search. When adding in the hexacopter drone to do aerial photography, we now have three components working in tandem – a group that uses their eyes to see the surface, a group that uses the ocean to “see” the sounds, and a group that uses the air to capture identifying photographs. It truly is an interconnected effort. I haven’t gotten the chance to discuss just how beautiful Hawai’i is. I would think that it is generally understood that Hawai’i is beautiful – it’s a famed tourist destination in an exotic corner of the Pacific Ocean. But you have to see it to believe it. Melon-Headed Whales take an evening ride alongside the starboard side of Sette. I’ve been lucky enough to see the islands from a unique perspective as an observer from the outside looking inland, and I just can’t let the beauty of this place pass without mention and homage to its stunning features. Hawai’i truly is her own artist. Her geologic features create the rain that builds her famed rainbows, which in turn gives her the full color palate she uses to create her own landscape. The ocean surrounding the shores of Hawai’i are not just blue – they are cerulean with notes of turquoise, royal, and sage. She will not forget to add her contrasting crimson and scarlet in the hibiscus and bromeliads that dot the landscape. At night when the moon shines on the waters, the ocean turns to gunmetal and ink, with wide swaths of brass and silver tracing the way back up to the moon that lights our path to the sea. With time, all of her colors come out to dance along the landscape – including the sharp titanium white foam that crashes against the black cliffs along Kona. And if a hue is errantly missed in her construction of the landscape, early morning showers sprout wide rainbows as a sign of good fortune, and as a reminder that she forgets no tones of color as she creates. It is our responsibility to protect these waters, this landscape – this perfect artistry. It is critically important to protect the animals that live in the ocean’s depths and the ones that cling to the island surface in their own corner of paradise. I like to think that this study takes on this exact work. By giving each of these species a name and identifying them to each individual group, we share with the world that these cetaceans are a family of their own with a habitat and a purpose. When we “re-sight” whales that the team has seen in past studies, we further solidify that those animals have families and a home amongst themselves. The photo identification team counts every new scar, marking, and change in these animals to piece together the story of their lives since they last met with the scientists. Everyone on Oscar Elton Sette talks about the new calves as if we were at the hospital with them on the day of their birth, celebrating the new life they’ve brought forth to continue their generations. I like to think we all make a little room in the corner of our hearts for them as a part of our family, as well. The Frigate bird has a Hawaiian name, “Iwa”, which means “thief.” They call this bird “thief” because they steal prey right from the mouths of other birds! “Spyhopping” is the act of a whale poking his head out of the water and bobbing along the surface. It is legal for research ships to fish off the ship, so long as we eat what we catch while underway. This led to the shared consumption of some delicious mahi mahi, fresh from the depths for lunch today. Yes. It was as good as it sounds. Oscar Elton Sette knows how to celebrate! Yesterday was Adam’s birthday, a marine mammal observer. They decorated the mess in birthday theme, cranked up the dinnertime music, and the stewards made Adam his favorite – blueberry cheesecake for dessert! Much of the crew likes to pitch in with food preparation. The on ship doctor, “Doc”, makes authentic eastern dishes, and the crew made barbeque for everyone a few nights ago at dinner. Last night I was invited to attend an early morning session in the oceanography lab with oceanographer Candy Hall. 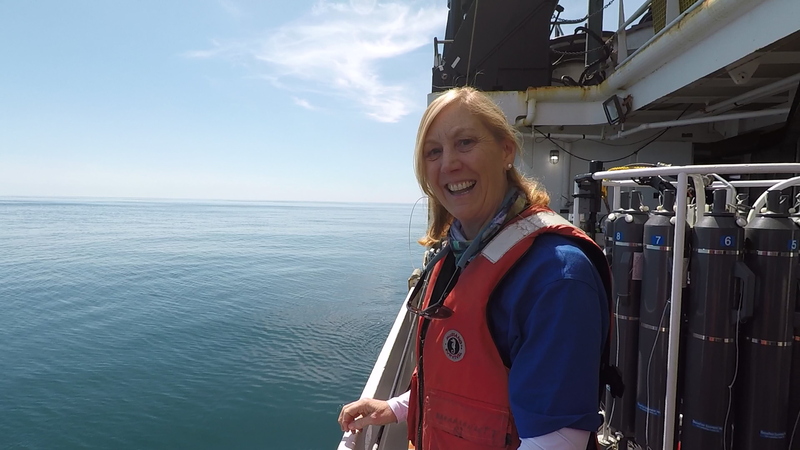 Like most mornings on this cruise, she and colleague Liz Zele were collecting water samples from 1000 meters and up with a device known as the CDT (Conductivity, temperature with depth). 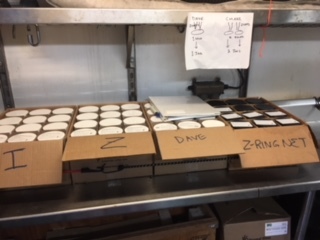 These samples are used to test things like nutrient, salt, and chlorophyll levels. Candy also runs a primary productivity test on the samples. This test will identify the rate at which phytoplankton grow. After a short nap, I was off to the flying bridge. 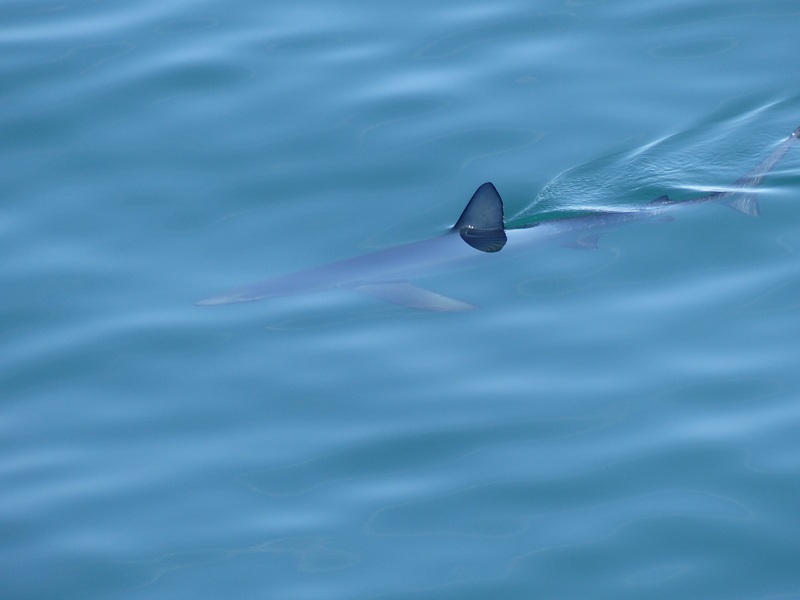 Due to the fact that the sun was shining (a first in over 2 wks) and the seas were calm, it felt like a promising day. There was the typical early morning fin whale sighting, followed by a lull. 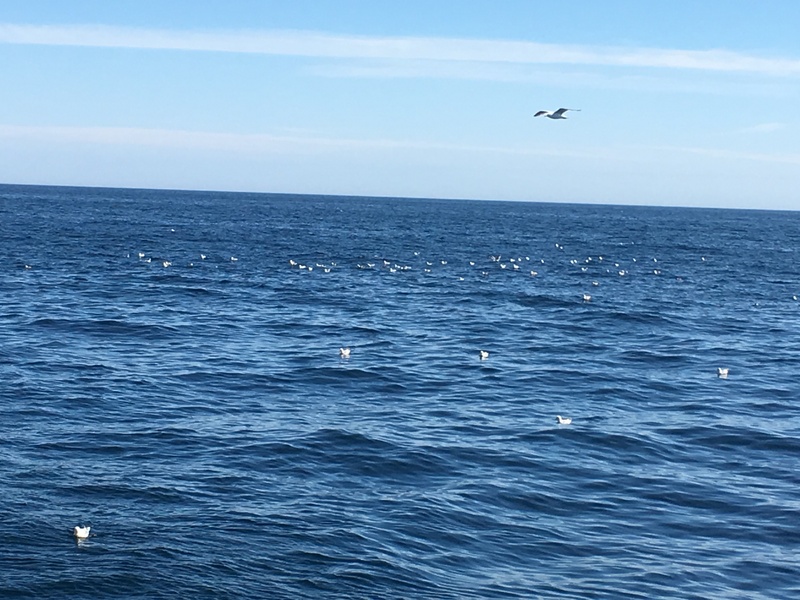 During this let-up it must have been decided that our time would be best spent fishing for albacore (as several trawlers were within sight). Almost as soon as the fishing lines were tossed over a blue whale appeared not far from the boat. The sun on the whale’s back made for a beautiful sight in and out of the water. It did not take long to get the small boat launched and on the trail of the whale for a biopsy and photographs. The time between mammal sightings was spent watching birds. My highlight today was observing a flock of arctic terns headed to Antarctica. This I am told is the longest migration of any animal. Today became more fruitful when four adorable Dall’s porpoises flirted with our bow for several minutes. To top it all off…as we were beginning to enjoy our first visible sunset and the rising of a nearly full moon, observers found spunky dolphins engaging in acrobatics worthy of gold medals near the horizon. It was not long before they graced us with their playful presence. Several of us took turns in the bow chamber and caught some underwater glances as well as auditory treats! Smiles all around. Yesterday, Monday, a somewhat elusive whale species showed itself despite the horrid weather. 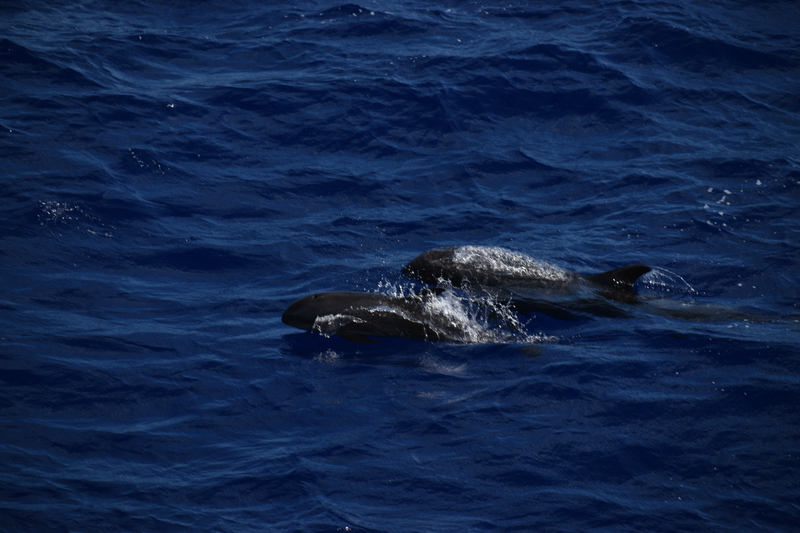 Two Baird’s beaked whales appeared around the boat for several surfacings. Luckily, the photographers were able to get a few good head shots. And, like most days, there was the morning fin whale sighting! Due to poor visibility, observers went off effort a bit early. Sunday also supplied us with less than perfect condition, but a fin whale was recorded before noon. The JORDAN picked up a worn-out, far from home hitchhiker in the afternoon. The deck of the ship hosted this cowbird for the evening. She hasn’t been seen since. Saturday’s conditions were similar to Sundays, but it was even colder. 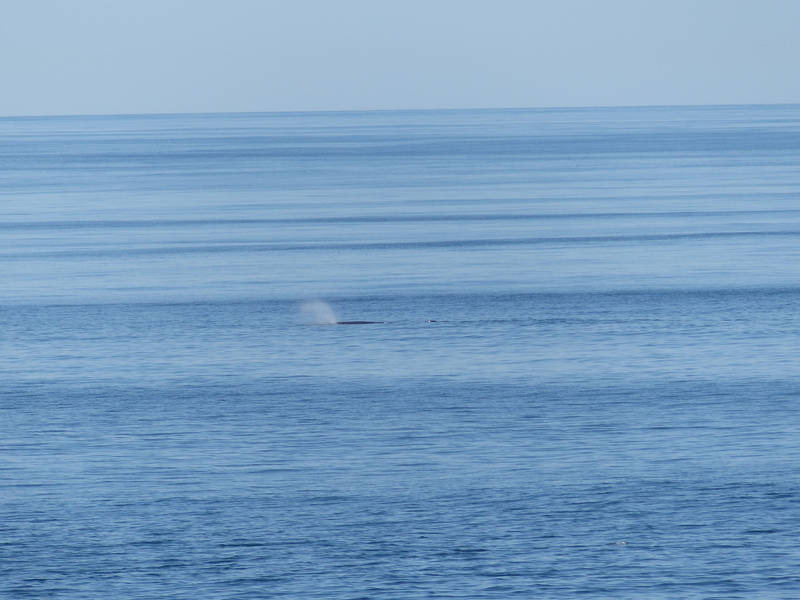 The only sighting was…you guessed it, a morning fin whale. When there are few sighting to report and animals to observe, the members of the JORDAN become curious about floating objects. During these “slow times” the ship has collected a few things, three buoys to be exact. Two of them are your standard orange plastic fishing buoys (probably headed for the dumpster). These buoys provided bonus entertainment because they had lines attached to them and thus “things” attached to the lines. The other buoy is a much more prized and sought after glass fishing buoy once used by Japanese fishermen. It was given to the captain. Tomorrow is our last full day of the cruise. Currently we are about 60 miles from the coast. Due to our position and course, tomorrow has the potential to be an outstanding day for observing marine mammals and birds.